I recently got in on the Ender 3 craze. Everyone buying this printer with rave reviews.... until you really start digging deep on it and start to realize it's flawed by one major problem... It's print bed is severely bent or dished to the point that you actually only have a 80X80 print area printer. Assembly is a breeze, less than an hour you have it put together, and you are initially impressed until you start to try and tram or level the bed to the print head. you keep finding that corners are hitting while the middle is miles away from the head, so you keep trying and finally find a 1 foot long straight edge and discover the bed is severely warped in 3 directions with over a 2mm sag in the middle. This instantly causes grief as you will never be able to print on this printer except for the dead center and a small area. slapping a piece of glass on top is also not easy as you dont have good contact for thermal transfer. so just buy a new bed..... for the new printer you bought, OK I'm game... so I search . 220X220 beds are all over the place. Well reality is this printer has a 235X235 print bed that has it's mounting screws at 170X170... that means you can not buy a bed for it. Creality refuses to sell the parts to this printer, nobody carries them. Also contacting creality directly only gets you a "put glass on it" and a refusal to send you a replacement part for their defective product. This means to fix the new printer you just bought, you need to spend about $100 getting a piece of aluminum machined at 235X235 and 170X170 mount holes that is flat.... oh and you lose a heated bed because nobody makes a heated bed element in this really strange size. How about retrofitting it to fix a standard 220X220? that means you have to replace the Y axis plate . you cant drill it because Creality has it cut too small for putting screws at 209X209 which is the standard for a 220X220 bed. at every turn Creality has intentionally made this printer so non standard that you can not repair or upgrade it with standard parts. Even more research turns up in every single 3d printer forum that talks about this printer . People are reporting warped beds to severely warped beds. This means that the chances of getting a defective product out of the box is getting to be significantly high. This puts me on the warn others about the possible flaws path about this printer. Yes you can slap a piece of glass on it, and that will work if all you print is PLA. you will need to even out the bed somehow to get even heat on the glass if you want to do anything else. But the problems don't stop there. extruder rubs the incoming filament against the Z axis screw and the Y axis carriage mount is extremely wobbly by using 4 V groove wheels in the center and no linear rails to the sides for stability. you can upgrade to a central linear rail to fix this for about $30 to solve this engineering problem. Also the extruder stepper is of very low quality, many people online and myself included have notice that after a short while you hear squealing from the extruder stepper as the bearings wear extremely quickly. so expect to replace the extruder stepper as well in short order. I also recommend replacing the belts as well with something better, these seem to stretch and cause ringing in the prints. I was surprised at how much give the belts have compared to even the belts that come on the monoprice printers. 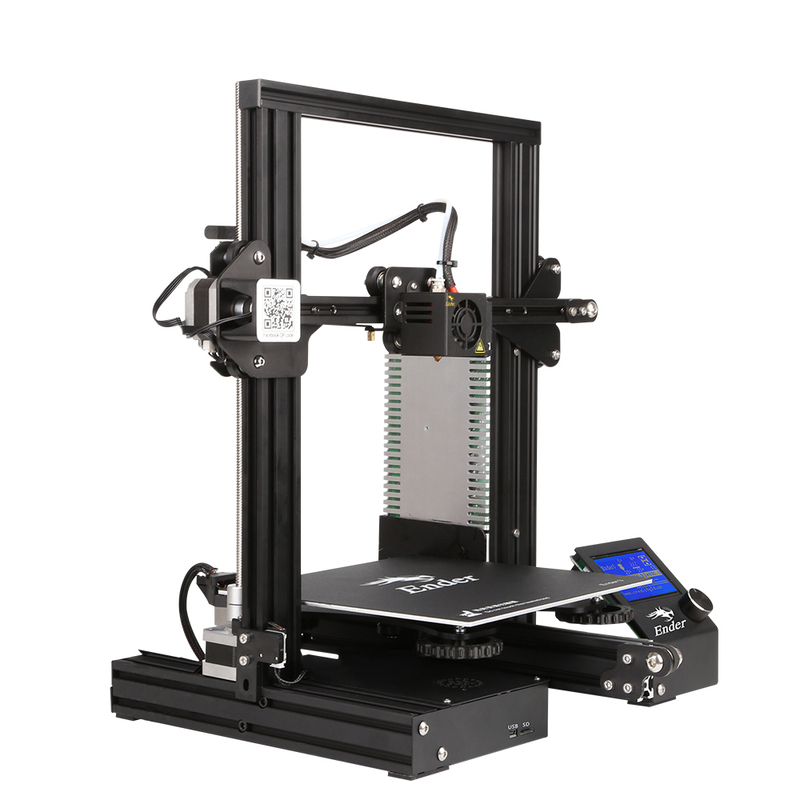 When it's all said and done, to fix your new Ender 3 printer to be useable will cost you about $300 and there are a LOT of better printers out there that use standard sized parts and manufacturers that will gladly send you a new print bed to fix their defective warped bed. This printer had potential but the makers desire to cut as many corners as possible has made it something that I can not recommend to anyone purchase. After my communication with them, I cJust can not recommend buying any of their products simply because they refuse to send you parts to honor their claimed warranty for a printer that is broken or defective out of the box. If you do buy one, before doing anything put a straight edge on the print bed. if it's warped immediately return it and ask for a replacement or refund. People need to keep doing this until Creality gets flooded with returns to the point that they have to start paying attention or their sellers stop selling their product that is defective out of the box. Dont bother emailing them they will not help you at all and only repeat the same thing over and over . "we are sorry but we can not send you anything" . I guess sorry makes it all better. Update: I have 2 spared beds.... both curved. Bought a second hand Ender3 for $100 it's bed is also curved and is why the previous owner could not get anything to print other than very small things in the middle of the bed. the forums are filling up with people reporting this major flaw. so absolutely be aware that you have a significantly high chance of getting a print bed that is not flat. I also replaced the extruder with a titan and that solved a lot of extrusion problems as the stock extruder's spring get's weak over time as it is not hardened spring steel. Buying and installing an EZABL made a giant difference in the reliability of the printer, it now maps the curvy surface and will make it so you can print a raft and have a flat surface to print on.